Yoga is used to maintain or gain muscle tone, balance, strength and an improved frame of mind. Yoga also benefits posture, decreases pain, and increases range of motion and flexibility. Margaret is an experienced gentle yoga teacher and believes anyone can do yoga. In her classes she encourages students to quiet the mind through breathing, flowing through gentle postures and ends the class in deep relaxation. She modifies each and every class to meet her student’s needs. Her training has included 200 hours teacher training with Yogiraj, Alan Finger (ISHTA), and 300 hours teacher training, Susan Bowen, Thrive Yoga Studio. She has also completed certificates in Reiki 1 and 2 and Mindful Yoga Therapy for Veterans Coping with Trauma. Her gentle classes include techniques from Sarah Meeks and Dr. Loren Fishman and Ellen Saltonstall (Yoga for Osteoporosis and Arthritis). She helped develop yoga classes at Walter Reed National Military Hospital for emotionally wounded warriors and patients suffering from TBI. 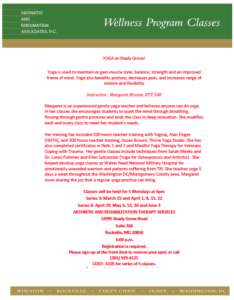 She teaches yoga 5 days a week throughout the Washington DC/Montgomery County area. Margaret loves sharing the joy that a regular yoga practice can bring. COST: $105 for series of 5 classes.